The Gnome Shell overview relayout has been merged into the master branch. That means it is now officially part of Gnome Shell. Unfortunately, it doesn't include any elements from the Tiled View mockups we've seen a few days ago but it's probably too soon for that. The launcher / application switcher on the left is only available in the Activities view. Moving your mouse to the right edge of the screen will bring up the controls to add/remove workspaces. Even though there's a search box, the applications could really use some categories to be organized into. Right now, switching desktops just doesn't feel right as the desktops overview is not available anymore (so you can't see all the desktops at once). 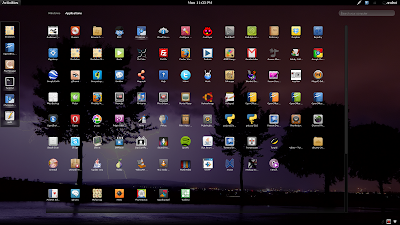 Hopefully the Tiled View will be included soon as Gnome Shell still lacks in usability. 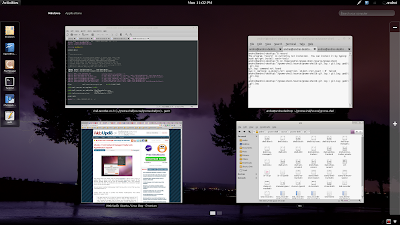 If you want to try out Gnome Shell yourself, I've updated the instructions in our Install Gnome Shell (From GIT) In Ubuntu 10.10 Maverick Meerkat post.